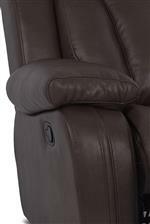 Comfy and casual this power reclining sofa gives you function and comfort. The center seat back flips down to reveal a table and cupholders. 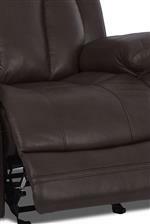 This sofa features bucket seats, two reclining ends and heavily padded seats for comfort. The Atticus-US Casual Power Reclining Sofa With Table by Klaussner International at AHFA in the area. Product availability may vary. Contact us for the most current availability on this product. Leg or Skirt Hidden reclining bases. The Atticus-US collection is a great option if you are looking for Casual furniture in the area.